Shown here (right) is Harry Wallner’s Suiseki stone that was accepted for presentation at the Fifth World Bonsai Convention at the National Arboretum in Washington, DC, May 2005. Suiseki” comes from the words“ Su” [water] and “seki” [stone]. The stone’s name has undergone transformations - as have its meanings - in different countries. When the stones first “came” to Japan in 600 AD, they were often known as “viewing stones.” Korea and Southeast Asia also display a version of this art form. But it was originally brought in from China and later adopted by these other countries. It is generally a single stone often displayed on a wooden base and carved into the shape of the base. 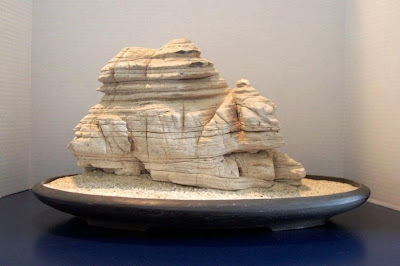 It can be set in a shallow container filled with sand, fine gravel or water and can represent a stream, a mountain, a hut, a shack, or a flower. Perception then transforms it into a work of art. vary, some being rounder, and some, as in China, flatter. Types of stones will also vary. Some may be granite; others, quartz. Harry’s rock with its vertical bands of chert, sandstone, and shale is reminiscent of water flowing down into dry streambeds. Thinking that it might have come from a riverbed in Colorado, he chose to set it in a desert landscape of light sand.